Nehemiah, Cupbearer to King Artaxerxes, returned to Jerusalem with the King’s decree to repair Jerusalem’s walls and gates which had remained in disrepair and ruin since the time of the Babylonian exile. Although the Temple had been rebuilt, the unwalled city of Jerusalem was not safe because of the hostility of Israel’s neighbors. Particularly interesting and often overlooked in the book of Nehemiah is the story behind the gates of Jerusalem. There were 10 “Gates” in Old Jerusalem. These gates were not only integral in the rebuilding of Jerusalem, but contained within each of them are hidden (sod) spiritual messages about God’s plan for individuals and also His Grand plan of redemption for mankind. The Order of the Gates is intentional because it represents our spiritual journey. We begin with the Sheep Gate. The Sheep Gate is the 1st Gate mentioned in Nehemiah 3. People would bring their lambs and sheep to the Temple for the sacrifices through this gate. The Sheep Gate represents the starting point for every Believer. Everything begins with the offering of the Lamb of God. Jesus Christ is the beginning of our spiritual journey. This gate points to Jesus’ first coming 2000 years ago as the Lamb of God who takes away the sin of the world (John 1:29). He is the door by which everyone must enter to be saved (John 10: 7-9). The sheep Gate is the only gate that was consecrated (set apart as Holy/Nehemiah 3:1). There were several valleys surrounding Jerusalem and this gate apparently opened out to the valley of Hinnom. Although a new Christian may experience a “honeymoon period”, sooner or later the valley gate must come. The valley gate speaks to us of humbling and trials – valley type experiences used by the Lord for our personal growth. Never easy but the Christian needs to remember that in the natural nothing really grows on the mountain tops, but it certainly does down in the valleys. Psalm 23:4: Even though I walk through the valley of the shadow of death, I fear no evil, for You are with me; Your rod and Your staff, they comfort me. All of Jerusalem’s refuse and rubbish was taken out through the dung gate, down to the valley of Hinnom, where it would be burned. After we complete our valley experience, the result is clearly seen in this next gate – the dung gate. This is where the rubbish is removed and this is what happens in our own life. Valley experiences are used by the Lord to clear away the rubbish so that true faith, refined by the fire, can come forth and produce fruit. 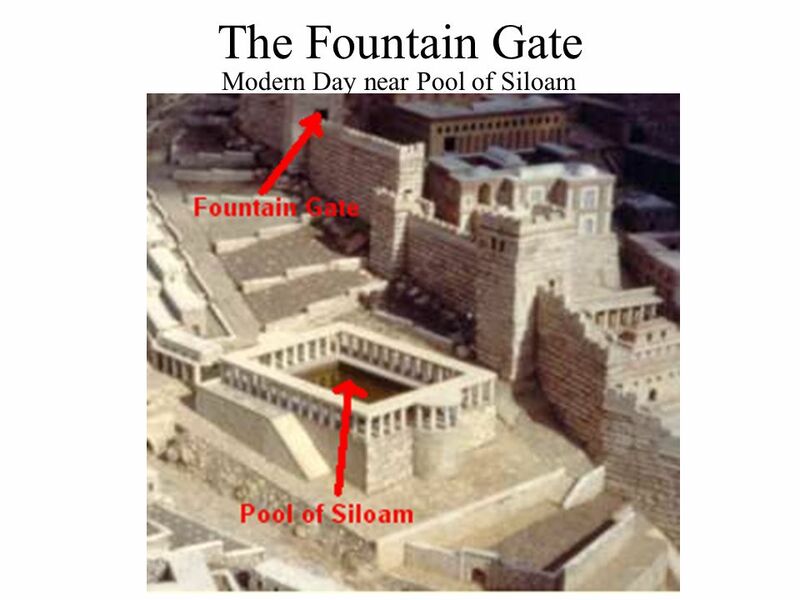 The fountain gate is located near the pool of Siloam and was often used by the people for cleaning before proceeding on to the temple. The fountain gate is located extremely close to the dung gate. In other words, after a valley type experience where rubbish in our lives is cleared out through the dung gate, true faith comes forth and the fountains begin to flow quite quickly! This speaks to us of the living waters of the Holy Spirit that cleanse our lives and empower us for our Christian life. Jesus said: ‘Whoever believes in me, as the Scripture has said, streams of living water will flow from within him.” (John 7:38). The Water Gate led down to the Gihon Spring which was located adjacent to the Kidron Valley. The water gate is a picture of the Word of God and its effect in our life. Eph 5:26 states ‘… having washed her by the water of the word.’ Psalm 119:9 states that it is only through God’s word that we can be clean. It is no coincidence that this gate was located next to the fountain gate as the two often go together. The Holy Spirit is the one who makes the word of God alive to us personally, allowing cleansing, encouragement and direction to take place in our life. The horse gate was close to the King’s stables and the men of Jerusalem would ride their horses out of this gate to war. The horse gate speaks to us of warfare as horses were used in battle and became a symbol of war. Revelation 19:11 ‘I saw Heaven opened, and behold a white horse; and he that sat upon him was called Faithful and True, and in righteousness does He judge and make war.’ Every Christian is in a Spiritual war whether we know it or not. #9: East Gate – HALLELUJAH! The Eastern Gate of Jerusalem is also called the Golden Gate or the Beautiful Gate (Acts 3:2). In Hebrew, it is Sha’ar Harahamim, the “Gate of Mercy. The Eastern Gate was sealed shut in AD 1540–41 by order of Suleiman the Magnificent, a sultan of the Ottoman Empire. The final gate is the inspection gate, also known as the Miphkad gate. The word in Hebrew has a military connection and according to tradition it was at this gate that David would meet his troops to inspect them.This gate speaks to us of the examination of our lives by the Lord. This occurs in this life as indicated by Paul in 1 Cor 4:4: ‘For I am conscious of nothing against myself, yet I am not by this acquitted; but the one who examines me is the Lord.’ The ultimate fulfilment is at the Bema seat of Christ (as spoken of in 1 Cor 3:10-15, 2 Cor 5:10) where our lives are inspected and rewarded appropriately. In our Christian experience we should be living with this in mind. We are called to live our lives with eternity in view, caring more for the things of eternity than the temporal that we see around us.